A Toy Theatre is a miniature stage, built in card or wood and brightly coloured. Children perform plays on it using characters and scenes cut out from printed sheets and text written in a simple “playbook”. The audience would normally be family and friends and the auditorium the front room. Adults too are known to use them, especially the large elaborate versions published in Germany and Denmark. As well as being a flexible means of expression, the sheets represent a vibrant folk art derived from the full size theatre. 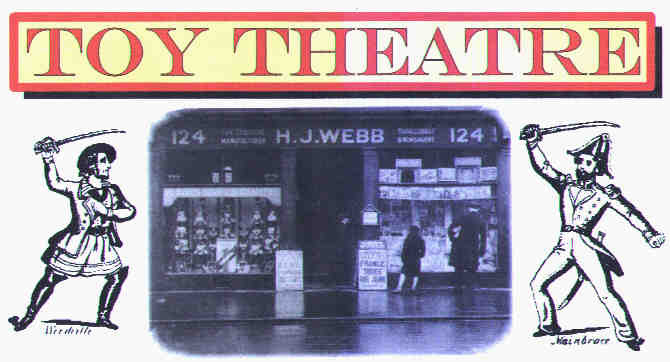 It is a unique record of real plays and stage presentations, particularly of the nineteenth century. Many enthusiasts collect and study old sheets for this reason.